Tag line: "They called it an accident. He called it murder. It was their conspiracy. It was his son"
George C. Scott was a hell of an actor; along with his bravura performance as the title character in 1970’s Patton, he was terrific as Ebenezer Scrooge in 1984’s A Christmas Carol, my favorite film version of Charles Dickens’ classic holiday tale. In 1972’s Rage, Scott not only played the lead, but also tried his hand at directing, and thanks to a solid cast and some nerve-racking sequences, this drama / thriller proved he was just as successful behind the camera as in front of it. While out camping one evening, sheep rancher Dan Logan (Scott) and his son Chris (Nicolas Beauvy) are exposed to an experimental nerve gas, which had been released accidentally by a military helicopter. The next morning, Chris is non-responsive, and is rushed to the emergency room where Dr. Holliford (Martin Sheen) looks after him. Telling a concerned Dan he has no idea what caused Chris’s illness, Dr. Holliford recommends that, as a precaution, the elder Logan also check himself into the hospital, so that they can run a few tests on him and make sure all is well. Unbeknownst to Logan, Dr. Holliford is also an Army officer, and involved in the military’s attempt to conceal the accident. Several days pass, during which time Logan (still in the hospital) receives no updates whatsoever on his son’s condition. Frustrated and angry, he sneaks out of his room and searches for answers. What he finds instead is the truth about the cover-up, at which point Dan Logan decides to take matters into his own hands. 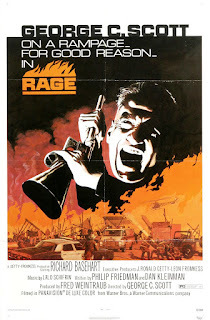 Scott delivers a searing performance as Dan Logan, especially in the film’s last 20 or so minutes, when his character is in full revenge mode (Logan is downright cold-blooded in these sequences, a few of which are shockingly violent). But there are also large chunks of Rage in which Scott is not featured at all, when the movie instead focuses on the cover-up, and it’s in these scenes that the fine supporting cast takes center stage. A young Martin Sheen is convincing as Dr. Holliford, the army surgeon who is a master of deception; and Bernhard Hughes is equally as good playing Dr. Spencer, a member of the public health service (which has aligned itself with the military). In addition, Richard Basehart is excellent as Dr. Caldwell, Logan’s personal physician and longtime friend who eventually realizes there’s more going on than he’s been led to believe (at one point, Dr. Caldwell tries to tell Logan the truth, but is prevented from doing so). Rage does have some pacing issues (a late scene where Logan breaks into a laboratory drags on longer than it should), and Scott utilizes slow-motion a little too freely (he even employs it when his character spits while chewing tobacco). In addition, the entire opening sequence - before Logan and his son are infected - is undermined by the film’s score (it overpowers the entire segment). Fortunately, the movie’s strengths outweigh its weaknesses, and the superb cast plus a very intense storyline do their part to make Rage an effective enough thriller.